Our aim is to bring music learning to the 21st Century by combining relevant digital technologies with traditional music making. Whether it is composing or performing, we believe that learning music has to be brought into and made relevant with the many digital tools available to us. Because of our approach to music learning, and with the constant changes in technology, the courses that we offer will keep getting updated and progressively relevant to students in the present or the future. 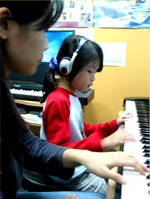 Our team of dedicated and qualified music instructors have extensive experience in music education, performance, composition and arrangement using current technology. Through our philosophy, we provide our distinct brand of learning experience, inculcating greater creativity with endless enjoyment and fun, through music making. © Copyright MusicTEC Pte Ltd 2013. All Rights Reserved.